Syrian President Bashar al-Assad has rehashed his lines. There is little else interesting or newsworthy in the excerpts from the interview with Assad posted on the magazine’s website. What is intriguing though are the motives of a publication partly-owned by the Egyptian government for giving Assad a platform to attack the Syrian revolution and its leading regional backers. It’s akin to a periodical in Washington choosing to interview Pol Pot when his gang was taking Cambodian lives during the mid-seventies. The latest statement from the Russian Foreign Ministry last Tuesday called for a return to the Geneva communiqué of the Action Group for Syria (AGS). Kofi was in Tehran listening carefully to Iran’s love of peace and harmony in Syria and the region, and especially in Bahrain and the rest of the Gulf. There’s something odd on the international stage concerning Syria. There are disparate languages and a monotonous tone. America is similar to Russia. Moscow repeats that the Syrian president need not stay in power. Washington has been reciting for a year that he is on his way out. Lakhdar Brahimi is meanwhile saying what Kofi Annan said. In their opinion, Bashar al-Assad is restating his love of the homeland, the nation and steadfastness and that Syria has no problem other than countries arming terrorist gangs. Everyone behaves as if the innocent people being killed every day were Siberian white cranes, the sort of endangered birds Vladimir Putin is trying to save from extinction. The world is full of travesties. 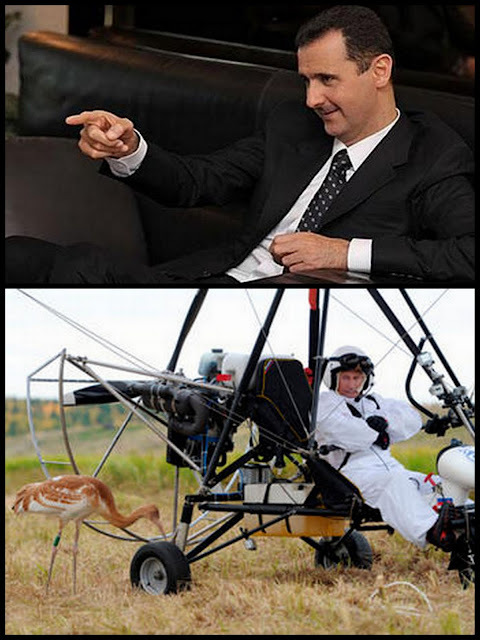 The most insolent of them is to see a world leader taking to the sky in a motorized hang glider while his warplanes were bombing Aleppo, raising the number of Syrian fatalities above 30,000. The comportment of all sides vis-à-vis Syrians has been dull and repetitious in many languages. Hillary Clinton did not offer Syrians more than Sergei Lavrov, who recently ceased his daily barbs, ordering his subordinates to do the talking instead. One state used the veto and another followed in its suit. The pair crippled the Arab League and UN Security Council and agreed on doing nothing more than audit the daily numbers of killings in Syria. In truth, both principals realize there’s no solution. All conferences and communiqués will lead to nothing other than what we see: carnage from the air, shrieks of death on the ground, tents awaiting refugees and storms, and the anticipation of Assad’s next verbiage and his dialogue with the opposition he cloned.